I was crazy about him a while back to, but I've come to watch him a bit more. Might be a better foligno but that is it. Is a better Foligno a bad thing? We could use some toughness + in our forward ranks. Having a game plan card pictured like that is ... not great? It's no bueno. Why would anyone who considers himself or herself a fan post that? I don't suppose it's in any way actionable on the part of the Sabres? For example, if they knew who did it, suspend season ticket or ticket privileges? I can't imagine it's legally actionable. Just wouldn't be surprised if his scoring went down. Put him on a line with Casey and Reinhart and he could help create some room and secondary scoring. Do we know that it was taken by a Sabres fan? I suppose the Sabres could look to deny entry or access to the person(s) who took and published the photo. It's their barn - they can deny access to whom they like for any non-discriminatory reason. Beyond that, I can't see any legal basis for grieving what the photo taker did. Those are pretty clearly cribbed notes -- a single page of them (there look to be more pages) -- that embody the bulleted highlights of a game plan. I think you're overthinking it a bit. This is interesting stuff for us as fans, but I doubt it's interesting to opposing teams. You can see the fan's Sabres jersey reflected in the glass. A fun question: would the Sabres' PP be better or worse this season if Phil let Jack coach it? I forgot to remind you knuckleheads in my OP that the game is in Buffalo, so no pillaging and baby eating. @darksabre, we can calm down for now, but we must keep vigilant. It is only a matter of time before a disastrous goalie decision is made. I just got paid over $3,000 from 2 clients that I finished up year ends for ... 1st round is on NS!! I'm not seeing any reason to doubt the authenticity. You can see the a fan's Sabres jersey reflected in the glass. But, yeah. Pretty clearly a Sabre fan's snapshot. As for publishing it: That is just the time in which we live. Nothing says crap regular season hockey like a Thursday night tilt between the Sabres and freaking Hurricanes. I love the sense of hope. You watched some/much of the win streak, right? And you've watched the team play at a bottom-5 pace since then, right? Winning two in a row would honestly be pretty meaningful since this team is so bad at it. They haven't won 2 in a row since December 13th. Save it for the games played at Carolina. Thursday the 13th.....the start of a new Thriller movie series. Not only that we're tied with Carolina with one game in hand and we really can't afford to keep losing ground to the teams above us. If there was a must win, well, it's tonight. Of all the must wins this is the must winest. 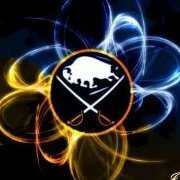 The Sabres really need to take care of business for themselves here, especially against teams that are chasing them. And, hope that teams just ahead of them falter. And win those games with the teams just ahead of them.